As many as 96.96% of deputies at the first session of the 14th National Assembly on July 27 approved a resolution determining that there will be 27 members of the Government in the 2016-2021 tenure, the same number as in the previous tenure. Legislators casted secret ballots to elect the Vice State President, Chief Judge of the Supreme People’s Court and Prosecutor General of the Supreme People’s Procuracy in Hanoi on July 27, the sixth working day of the 14th National Assembly’s first session. 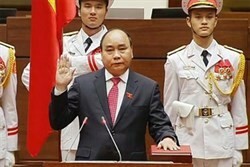 As many as 485 out of 489 deputies present at the July 26 plenary session of the 14th National Assembly, or 98.18 percent, voted for Nguyen Xuan Phuc as Prime Minister for the 2016-2021 tenure. Nguyen Van Binh, Politburo member and Head of the Party Central Committee’s Economic Commission received visiting US Treasury Under Secretary Nathan Sheets in Hanoi on July 25. 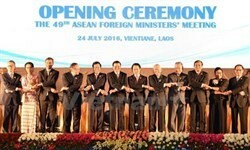 The 49th ASEAN Foreign Ministers’ Meeting (AMM 49) opened in Vientiane, the capital city of Laos, on July 24 under the chair of Laos, the rotary Chair of the Association of South East Asian Nations (ASEAN) this year. 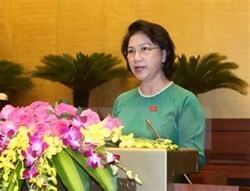 Nguyen Thi Kim Ngan, chairwoman of the 13th legislature, has been re-elected as chair of the 14th National Assembly after the voting results were announced by the vote-counting committee in the morning of July 22. The 14th National Assembly (NA) passed a resolution on the number of members of the new NA Standing Committee early during the second day of its first session on July 21. Deputy Prime Minister Trinh Dinh Dung on July 20 received Lisa Davis, Member of the Managing Board of Siemens AG. The 14th National Assembly (NA) opened its first session on July 20 in Ha Noi, focusing on electing high-ranking State personnel in the 2016-2021 period. 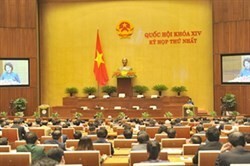 The 14th National Assembly will convene its first session in Hanoi from July 20-29, Vice Secretary General of the NA Le Minh Thong told a press conference in the capital city on July 19.